Reclaimed barn lumber, fabricated steel, and earth. 7.5' x 7.5' x 6' (object) 14' dia. earth ring. Azimuth is one of four sculptures from my 2016 MFA thesis exhibition titled 'Rural Decay Almanac' at the University of Maryland College Park Art Gallery. The following is an excerpt from my written thesis. An Azimuth is an angular measurement in a spherical coordinate system. The vector from an observer (origin) to a point of interest is projected perpendicularly onto a reference plane; the angle between the projected vector and the reference vector is called the Azimuth. A good example of this is the position of a selected star in the sky… the star is the point of interest, the reference point is the horizon, and the reference vector points north. The azimuth here is the angle between the north vector and the projection of the point of interest (the star) onto the horizon. This concept is used primarily in navigation, but also in engineering and mapping. 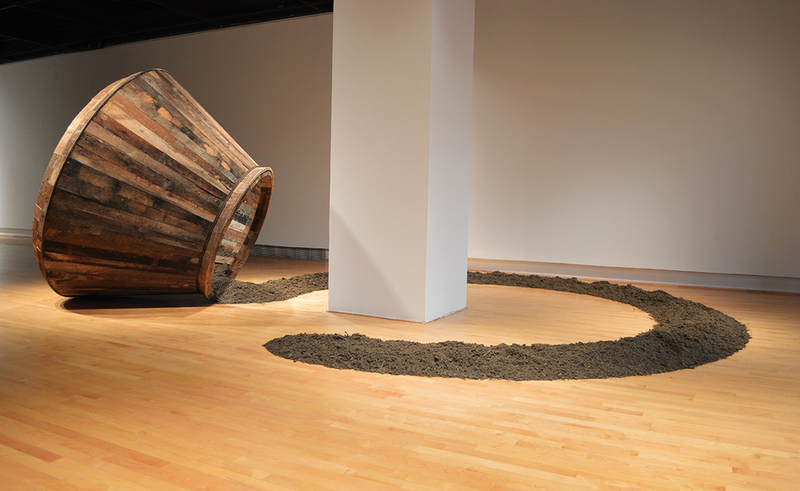 In the gallery, Azimuth has seemingly spun it’s course - a 14 foot diameter - leaving a trail of dirt behind. It’s function, although peculiar, is to tumble dirt inside the vessel as it spins around its axis, funneling it out onto the ground. A reference to agriculture and farming lies in the connection to crops and irrigation systems, specifically the mark they leave on the ground, as if they are unknowingly some kind of drawing machine. Dirt collected from the original site of the barn has been transported to the gallery. The scar the barn left in the earth has been transformed into the mark the new object makes in the gallery.